As someone with (very minor) natural gas reserve holdings in West Virginia, I’m envious of those in the Southwest who have an apparently unlimited market in the LNG export business. Numerous countries around the world, and especially China and India, would benefit from increased consumption of natural gas, especially if it were to displace current coal usage. They, and many smaller countries, also still rely on diesel fuel in backup generators as their power grids do not provide reliable electricity supplies. Now, the superabundant shale gas resource has allowed U.S. LNG exports to soar, rising from 40 Bcf to 1 Tcf in just 10 years, with plans for a further doubling of capacity by 2021. What happened in the early 2000s should serve as a cautionary tale, though. High U.S. gas prices led to plants for enormous investments in LNG import terminals, most never begun and most of the remainder now converted to export terminals. The shale revolution caught most of the industry by surprise; the massive 2003 NPC report on U.S. natural gas foresaw prices in 2015 as ranging between $4.75 to $9/Mcf. The actual was $2.75. Since shale gas has become so abundant, and U.S. prices so much below world natural gas prices, numerous export projects have been built or proposed. 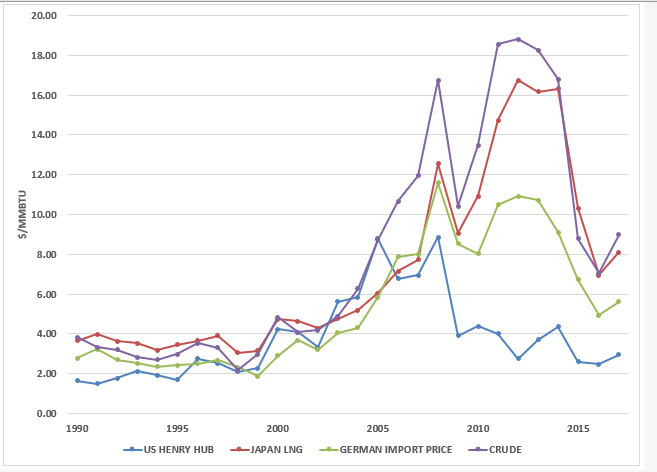 The most aggressive export plans originated several years ago, when elevated oil prices and the nuclear power shut down in Japan sent LNG prices to double digits—reaching over $16/Mcf in Japan from 2012-2014. These were, of course, transient developments which should not have spurred long-term investment, as I warned in 2013. Natural Gas and Crude Oil Prices $/MMBTU The author from BP data. Previous article She Wanted Her Town To Breathe Clean Air. She Got Death Threats Instead. BLOG: How Can Service Companies Avoid ‘Kodak Moments’?